Posted March 19, 2019 by Andrea Laford & filed under Headlines, News. 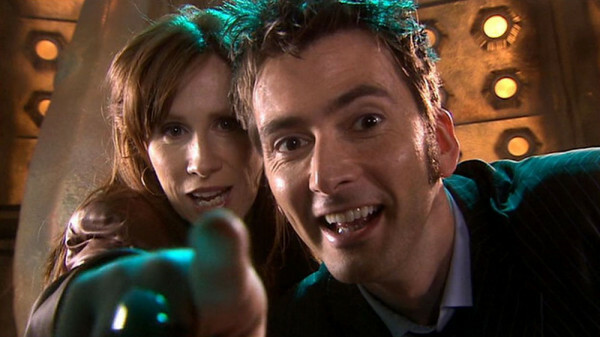 In a podcast interview with her former Doctor Who costar David Tennant, Catherine Tate revealed that she was surprised to be asked to reprise her role as Donna Noble as a regular companion on the show. Both Catherine Tate and David Tennant reminisced about their shared experiences on David Tennant Does a Podcast With…. Debuting as an unexpected guest on the TARDIS at the very end of the Series 2 finale episode Doomsday with David Tennant as the Doctor, and again in the premiere Series 3 episode, The Runaway Bride, Catherine Tate thought that would be the extent of her involvement in Doctor Who. Tate wasn’t even aware that her character was so popular with fans. In fact, while she was filming Partners in Crime, a journalist on set informed her that some fans were not enthused that Donna Noble would be back. Along with David Tennant’s assurance that Donna Noble is a firm fan favorite, Tate has since attended many conventions where the attendees gave her no doubt on the popularity the companion.